What is a change of address form? Anyone who desires or wishes to get his address changed has to use an official document or request for this process. This formal written request is known as the change of address form. It is going to be filled by a person who wants his office or house address to be changed in some record. 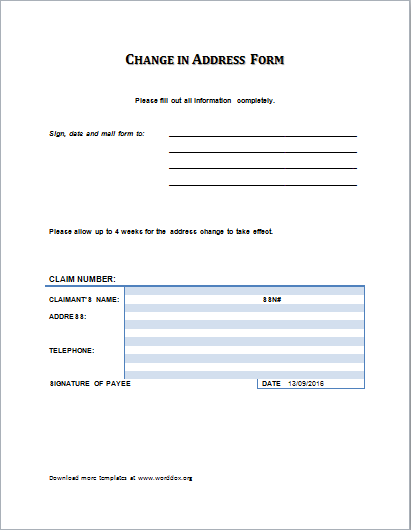 The contents of the change of address form are pretty simple and standard in most cases. They may include details of current address, the name of the individual desiring the change of address and new address and its details. The form may also require you to furnish the reason for changing the address and the date from when the address should be changed. The form should be updated in a timely manner without any delays to avoid mistakes in correspondence and communication. They should be submitted to the organization of concern and its respective department of interest. The address of a person is a very important element of personal information and data. Anyone who wants to make any type of correspondence or delivery to that person can only do so if they have their valid address. Other types of addresses may include a permanent address or temporary address.